WILSONVILLE — After dropping its first game against the Mountainside Mavericks 2-0 in the Westview Tournament on Sept. 29, the Wildcats looked to rebound against league foes La Salle Prep and Rex Putnam high school. The first opponent was La Salle Prep, who Wilsonville previously dispatched in three sets. The second time around would prove to be more difficult. On Monday, Oct. 1 Wilsonville bested La Salle 3-1 with scores of 21-25, 25-20, 33-31, and 25-21. It was the most the Wildcats had been tested, and the team ended up passing it getting to 13-1 on the season. The lost set was Wilsonville's first set lost in league play. 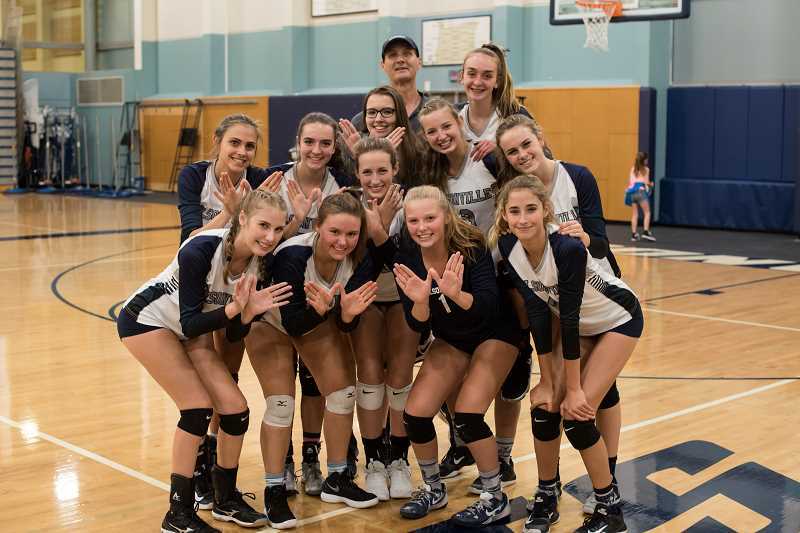 "Through all of our drills, all of our exercises, everything that we do, I try to make them understand that, with coaching, it's not only training the physical, but it's also training the mental," Wilsonville head coach Nathan Blankenship said. "Oftentimes that gets overlooked. You have to build that mental toughness, especially when you get into tough games like we had against La Salle. Very tough game. We dropped the first set, and had to win the next three. They were a very tough team, and they were taking no prisoners." After that tough battle, the team looked to repeat its winning ways next against Rex Putnam in the next game on Wednesday, Oct. 3. It was a more convincing win the second time around, as the Wildcats won 3-0, with scores of 25-12, 25-12, and 25-19. Kills from junior outside Hitter Lindsey Hartford and Putnam errors eventually put the Wildcats over the top in the first set. Starting out the second set, Wilsonville fell behind initially 1-3, but went on 7-point run with more Kingsmen errors and kills from sophomore Clarissa Klein and a block from Emily Scanlan. The two teams went back and forth before Wilsonville put together another push to end the second set by the same 25-12 margin. In the third set, Wilsonville once again started down, this time by a margin of 4-10 after Putnam jumped out early. Once again though, the Wildcats remained composed and worked their way back into the contest. Once again, kills from Hartford and freshman outside hitter Ashli Edmiston were tacked on, as well as aces from Hartford and senior Meredith Thomas when they had opportunities as servers. Putnam made the second half of the set competitive, closing the Wildcat lead to five points. That was as close as they would get though, with Wilsonville capitalizing on Putnam hitting the ball out of bounds to win the final set 25-19. "We go out with a simple philosophy: play every match, every set, and every point as hard as you can," Blankenship said. "It doesn't matter who we're playing, what the score is, none of it matters. If we were playing the Olympic, they would go after every point the exact same way. Winning and losing is not on their mind. The mindset is each going after each point individually. That's a very powerful thing. It makes them tenacious, and tough to beat." The Wildcats (11-0 in NWOC, 14-1 overall) turn around to face off with the Parkrose (3-8 in NWOC, 6-10 overall) on Tuesday, Oct. 9 at home. Then, the No. 6 ranked team in the state takes place in the West Linn Tournament on Saturday, Oct. 13.